We help business leaders and teams to achieve a step-change in innovation performance, and to ramp up the return they get on the funds they invest in innovation projects. We do this by training and coaching teams in innovation skills and strategic thinking skills which give them the innovation know-how and the confidence to tackle ground-breaking innovation projects. We’ve helped our clients bring game-changing new propositions to market that have delivered millions of pounds of new revenue to their organisations. We’re exhaustive in our research and design process for our training so that you receive relevant innovation knowledge, crafted into manageable portions that you’re more likely to retain. We also facilitate creative spaces where teams can come together generate ideas and develop concepts that can build business and transform organisations. We’ve also helped our clients to get to grips with the risk of innovation so they’re confident to embark on more ambitious innovation challenges and scoop the higher rewards. "Anatellô are experts in facilitating creativity and innovative thinking in a business context." Standard or custom modules. We have training to suit all experience levels and include topics on any aspect of innovation. Whether you need support with the whole or part of a project, the Anatellô approach is suitable for all. 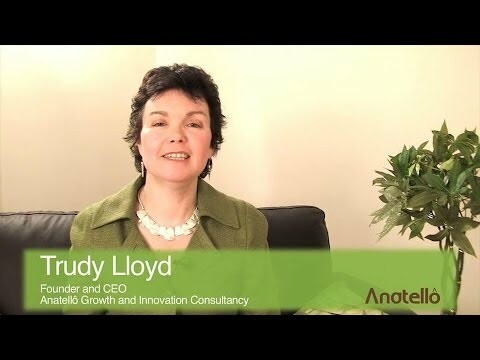 Trudy Lloyd outlines how the innovation consultancy can help with business growth.